Asian Handicap betting markets are perfect for football traders looking for an alternative to the more traditional 1X2. We explain what Asian Handicap betting is, how to bet on the markets, and their benefits. Traders and bookmakers interpret these factors and represent each team’s chances of success with odds – their implied probability of winning the game. Depending on the two teams’ perceived abilities, the difference can be significant, leaving little value on the favourite, and minimal returns on standard 1X2 markets. Asian Handicap betting markets counter the perceived bias in abilities, by levelling the playing field and removing the option of a draw – resulting in better odds. 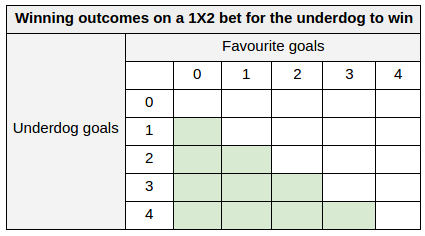 This is done by applying either a positive or negative goal handicap to each side depending on which team is perceived as the favourite (negative) or underdog (positive). A level Asian Handicap is offered when there is no perceived difference in abilities between two teams – both start the game with 0 goals. You are essentially betting on the overall winner of the game. The difference being that the draw has been removed; so if the match ends level, your stake is refunded. This is the same as a Draw No Bet market. The table below shows how the result on a Level Asian Handicap – no perceived advantage for either team – affects your payout. * Bet void: The bet is void and your stake is returned. Single Asian Handicap betting is ideal when there is a large perceived difference in ability between two teams. The supposed better team will be awarded a goal handicap to eliminate the difference in quality for betting purposes. For example they will start the game with -0.5, -1, -1.5, -2 goals. The table below highlights how the result on a Single Asian Handicap affects your payout. A Split Asian Handicap betting market is available when the adjudged difference between the two teams’ ability is less defined. The market allows you to split your stake on a team over two handicaps. For example a favoured team may start the game with (0 & -0.5), (-0.5 & -1), (-1 & -1.5) goals. 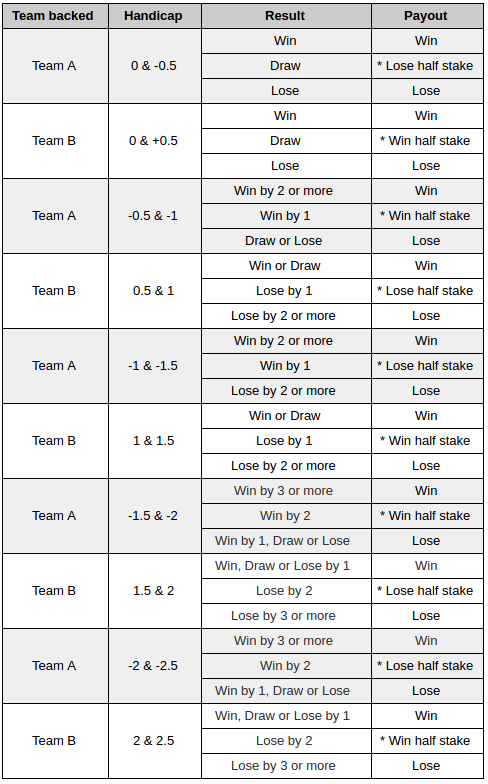 The table below outlines how the result on a Split Asian Handicap affects your payout. * Win half stake: You win half of your stake, which is multiplied by your odds, and half is returned. * Lose half stake: You lose half of your stake and the other half is returned. You can trade Asian handicaps in-play, reacting to match specifics, which allows you to trade exactly as you would on any other football market – placing bets pre-game to give you trade-out opportunities, or use the Asian Handicap market during the game to lock in a profit. Even if the team you backed are defeated, your bet can still win, or be voided, depending on the handicap. This lowers your risk of losing your bet compared to a 1X2 market. For instance the two graphs below show the winning outcomes on a bet for the underdog to win on the 1X2 market compared to the Underdog covering the + 1.5 goal handicap. Asian Handicaps are the chosen market for many professional bettors – meaning the market tends to offer better value. Betting margins are lower as the draw has been removed, giving you more chance of a sustained profit over time. By eliminating the perceived bias between two teams, it gives bettors more value on highly favoured teams. That’s it! Hopefully, that clears up Asian handicap Guide. You should now have the knowledge of handicap betting – How does the handicap work?